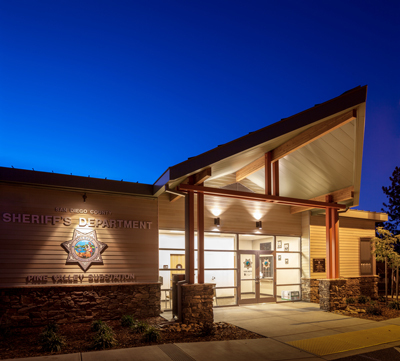 A ribbon-cutting ceremony was recently held to signal the completion of the new Pine Valley Sheriff’s substation for the county of San Diego. The new building, designed by San Diego-based Sillman Wright Architects, is more than triple in size from the existing facility and can accommodate five deputies with desk space for law enforcement partners at the federal, state and local levels. The facility, built by Harper Construction Co., has a briefing and conference room, offices, detainee processing and holding cells, evidence processing and storage, an armory and kennel. Sustainable features include photovoltaic panels on the roof, the use of low VOC paints, sealants, adhesives, recycled content materials and local materials. The exterior materials of the building reflect the character of the surroundings and include a transparent but secure 6-foot-high decorative fence. Trees on the site have been preserved and trees with taller canopies have been provided throughout for territorial reinforcement, to blend with the surrounding residential character. The new substation will serve a population area of more than 400 square miles. Additional project consultants included Burkett & Wong Engineers, LSW Engineers and Carter Romanek Landscape Architects.